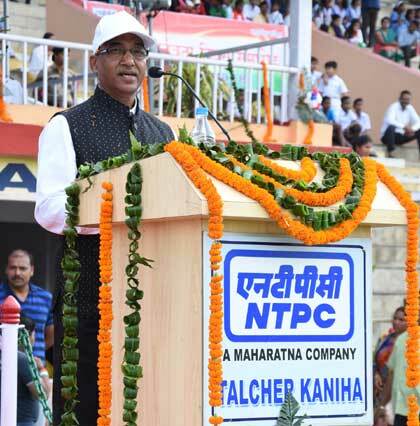 Kaniha: The 72nd Independence Day was celebrated at NTPC Talcher Kaniha on 15th August,2018 with patriotism spirit. Shri Ram Kuber,Executive Director hoisted the national flag at Ambedkar Stadium of the township. Shri Kuber in his address made a call to remember the contributions of freedom fighters for their contribution and sacrifices made for making our country independent. Speaking on NTPC Kaniha in the current fiscal year i.e 2018-19 (From April 1 to July 31,2018), the station generated 7406.4 million units with PLF of 84.32% which is better than MOU shared Executive Director. Towards environment protection, the station has organized world environment day, vana mahastov etc during such programmes the station has conducted 41000 mass tree plantation in and around the station, till date the station has planted 14 lakhs trees .As part of ash utilisation , the station manufactured ash bricks which were used for various CSR construction activities including allocating ash bricks to local community for construction works said Shri Kuber. In order to encourage excellence in work by employees, Executive Director Talcher Kaniha in presence of other senior officials awarded 58 employees with the meritorious award, 6 power excel awards, 2 manyavita award & Q4 E (Quest for excellence awards) & NOCET for their excellent performance were given. To celebrate the day, NTPC Kaniha in association with ladies’ club “Tanvi Sangam under CSR distributed 15 bicycles to Girl students & water purifiers to school and destitute center. The materials were distributed by Smt Deepti Kuber, President, Tanvi Sangam in presence of executive members of the club.